After the success and enjoyment of our last light painting night, we are having another go at our next meeting on Wednesday 23 January 2019 at the Haven Arms (Havenside, Hedon, HU12 8HH) starting at 7pm. The main light painting exercises will take place outside, but we have alternative ideas should the weather be too bad. Dramatic shots are available remarkably easily on cameras where you can control shutter speed, aperture and ISO, but mounting on a tripod is recommended. However, at our last session, members also got good shots on mobile phones too. The Hedon Viewfinders exhibition 2019 takes place from Wednesday April 24 to Saturday June 15 at the Hedon Museum. The theme of the Exhibition is “Hedon” and we are asking members to submit original and new work that reveals the ancient town in a new light. Prints (approximately 20-30) to be displayed in the exhibition are likely to be framed and mounted up to 50x40cm but we will issue further advice on this. For those members from Hull and surrounding towns and villages, we will organise some Hedon photo walks, and otherwise issue guidance on getting your shots of the town; its characteristics, flora and fauna, features and people, etc. 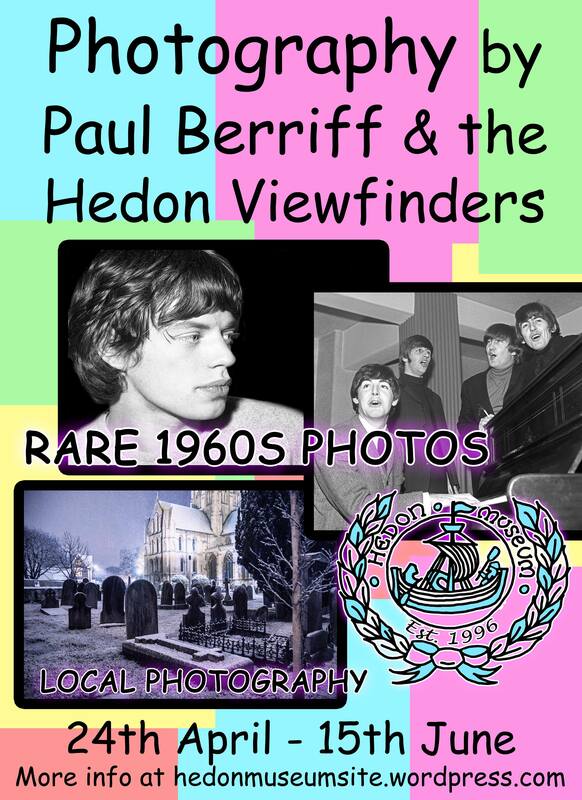 We will be exhibiting downstairs at the Hedon Museum whilst upstairs will be an exhibition by Paul Berriff OBE of his iconic photos from the 1960’s. Paul is an award-winning photographer and documentary film maker – and I’m pleased to announce that Paul will be speaking at a Hedon Viewfinders special meeting on Wednesday 17 April on his extraordinary life experiences. This will be ticketed event and should not be missed! Hedon Viewfinders will interest photographers of all levels; regardless of ability, whatever image making device kit or equipment you own. Novices particularly encouraged. Hedon’s free, fun and friendly photography group. Happy New Year! 2019 gets off to its formal start on Wednesday 9 January with our first meeting 7pm at the Haven Arms, Havenside, Hedon, HU12 8HH. It will be a ‘Props Night – a chance to experiment‘. This will be a great night for all those ‘wannabe photographers’ that got new cameras at Christmas to come along as well! All Welcome. Bring in your interesting objects (ornaments, toys, instruments, flowers, etc) and interesting kit and help create some photographic opportunities to share! If you need to get in early to set your prop up and claim table space, we’ll be open from 6:30pm. We are currently arranging further events nights, field trips and speakers – so please do pass on any ideas or suggestions you have got. Competition: Our Facebook group has a weekly competition based on a letter of the alphabet and the winner of each gets to have their photograph as the header of the page in the following week. Whilst this has been successful on Facebook with 1,563 images being posted over the letters A to R by 55 participants, we would also like to invite our members not on Facebook to get involved. This week’s letter is S and the weekly competition runs from Wednesday to the following Wednesday (entries by 10pm each Tuesday). If you want to take part and are not on Facebook, then we can e-mail out the competition details to you and alert you to each competition, and you can send your entries by e-mail – just get in touch. 52 Weekly Photography Ideas for 2019: Whilst not a competition, our new ideas page will be updated every Monday with a new prompt to creative photography. You can join in on social media using the hashtag #viewfinders52week(WeekNumber) or send in your photographs in response to each idea to us via e-mail. EXHIBITION 2019 takes place at the Hedon Museum from Wed April 24th to Sat June 15th. Look out for more details – but the theme is “Hedon” and you should be planning now to take your new photographs according to that theme. You should also note our meeting date on Wed 17 April 2019 – at 7pm we have a very special event taking place linked to the exhibition (you don’t want to miss it!). Look forward to seeing many of you next Wednesday.